Preheat the oven to 350F. 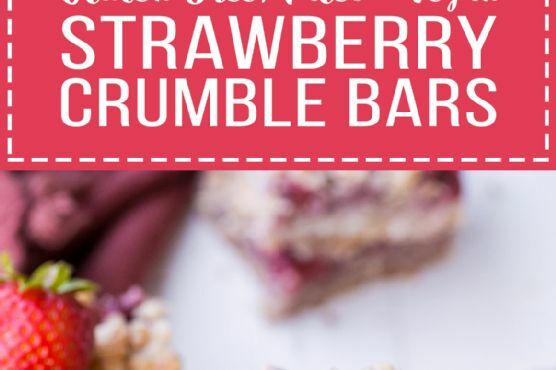 Line an 8x8 square baking pan with parchment paper and lightly grease with coconut oil.In a medium mixing bowl, stir together the diced strawberries, maple syrup and tapioca flour and mash up a bit to break up the strawberries. Set aside.In the clean mixing bowl, combine the almond flour, coconut flour, flaked coconut, maple syrup, almond butter, and coconut oil. Stir until the dry ingredients are completely moistened and crumbly. Press of the crust into the prepared pan.Top the crust with the fruit, and then crumble the remaining crumble topping on top. Bake for 35-40 minutes, until the fruit is bubbling and the topping is golden brown. Cream Sherry, Moscato d'Asti, and Port are my top picks for Crumble Bars. A common wine pairing rule is to make sure your wine is sweeter than your food. Delicate desserts go well with Moscato d'Asti, nutty desserts with cream sherry, and caramel or chocolate desserts pair well with port.